This London store, is four floors, (yup, FOUR) of marketing and M&M based #promotion and #customer experience on steroids for all forms of happiness, and I have to hand to them as much as it makes my teeth hurt with the sugar overload, they really have created an entire #experience that goes well beyond a bag of chocolate beans. It appeals as modern store experiences should, to as many senses as possible (including, for me at least, the sense of being overwhelmed). We have spoken before about how important variety is for brand experiences, so too appealing to as many senses as possible in store is important. Think of a rainbow. It’s simple but incredibly effective to line up the same product in multiple different colour options. 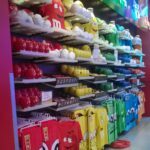 Each of the M&M colours has a character and the opportunity for merchandising is amazing – rows of the same product presented in different colour options. Visually it’s a feast. 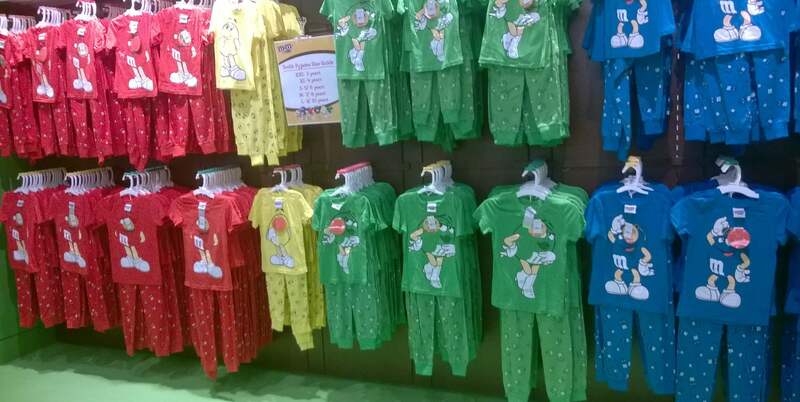 If only I understood why people want to wear a t-shirt with M&M’s on the front or dress their baby in an M&M’s romper suit. They do though, take a look on trip advisor, there are loads of positive reviews. 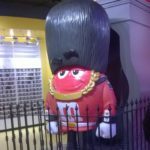 M&M’s world have ‘borrowed’ heavily from every British icon you can think of from the red London bus to the Beatles walking across Abbey road, union jacks made out of M&M’s and beefeaters, knights and princesses. It’s all there. And there are the tourists walking past the door on their way to the actual tower of London to hear about such things ready to have another photo opportunity with these characters. Appropriating some brand leverage from these icons and other brands like Star Wars creates new audiences and reasons to buy #product for M&Ms. 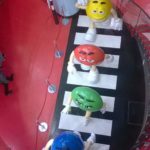 Customers have every opportunity to get their photo taken with any M&M character (or all of them if you like) the #people working in the store have clearly been sampling the happy merchandise as they are happy to participate and willing to take photos. Photos in your store, and with your products are a great opportunity to promote the experience; think social sharing and great write ups on trip advisor. I used to think that working in one of those old school coffee and cholocate shops would be my dream come true in terms of smells. They are incredible! M&Ms world doesn’t really have the coffee note to take the edge off the saccharine sweet smell in the air; it made me feel a little overwhelmed but I think I was alone on that score. Everyone else appeared to be embracing the sweet smells , including both my kids who made a bee line for the wall of M&M dispensers and the fabulous array of options available in the store that are not easily available in the local supermarket in Sydney. The sound of M&Ms falling into bags, the sounds of M&Ms videos playing in the background, the sounds of staff chatting to customers. It all adds to the vibe – this place sounds a little bit like a toddler birthday party to me, but that might have just been the time we were there. Customer experience is now very much about #personalisation, and to be able to make your own M&M’s is a fun way to create some brand engagement and personalisation. It’s available online too if there’s no store near you. This is the fun bit as far as I see it, and also the opportunity to make an off the shelf product bespoke to just you! Product placement and ease of moving through the store encourages customers to touch and to shop. The more times customers touch a product the more attached they become. The displays in this store allowed customers to wander and to touch, to find something (key ring, towel, clothes bag of chocolate packed in a multitude of different ways) anything that’s for you. We came up for air in the end 30 GBP lighter and I think nearly a kilo of chocolate heavier, the kids both with a spring in their steps that lasted for the next couple of hours (until the sugar crash comes to get you) after that last sense #taste had been well and truly involved. If this has inspired you but you don’t know where to start, why not contact us for a Business Review and we can work on a strategy together.